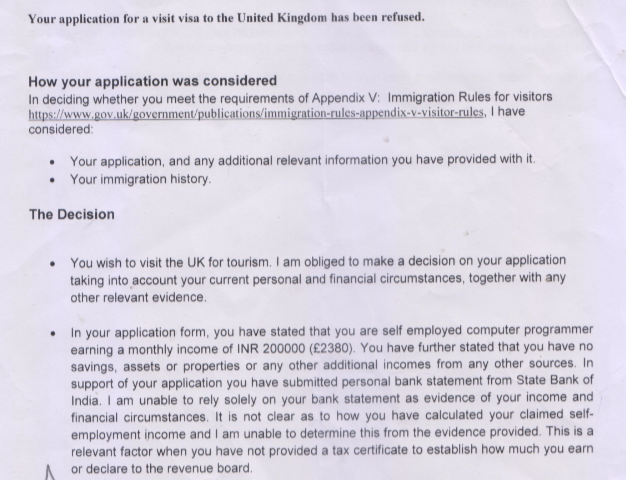 My application for a standard UK visitor visa was denied, citing lack of sufficient documents for evidence of income (tax returns). This is understandable, as I've only started to earn significantly since the last 12 months, hence only one year of tax returns was available and the case officer refused to consider my salary bank account statement as the sole evidence of proof of income. So now (2 months after refusal) I wish to reapply for the visa but this time with the entire travel sponsored by my parents. They have sufficient documents to prove their income, property evaluation papers etc. However the visa application form has a field that asks if my visa to the UK was ever refused, to which I now have to fill yes. Q1. How likely is the first refusal going to affect this new application? The refusal letter I received on my first attempt did mention that all future applications would be considered on their individual merits. But hearing from various sources this is still likely to be false and previous refusal may cause problems. Q2. Is applying just 2 months after the last refusal too soon. Will it raise eyebrows? 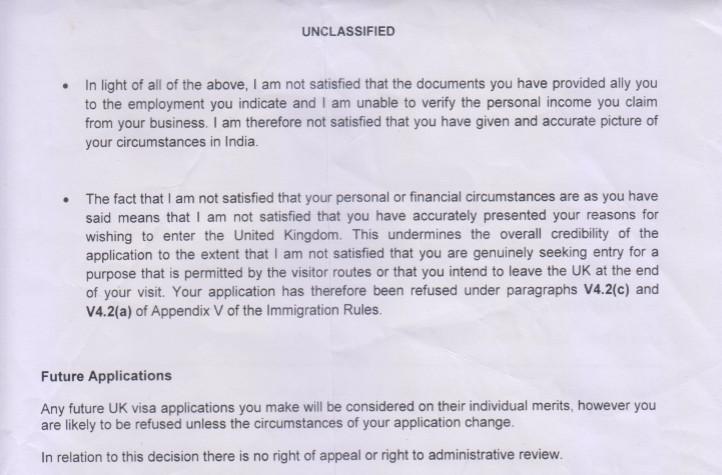 EDIT: The refusal letter indicates I did not provide a tax certificate even though I absolutely positive I enclosed it along with my application in the envelope provided to me at the VFS centre. Is it possible that the case officer simply missed that document or didn't bother with it since it was only one year's assessment? Your application was rejected essentially because you did not supply enough evidence that your income was really what you had claimed. Your bank statements were not considered enough because the money coming in could have been anything, not necessarily salary, but perhaps loans designed to inflate your bank balance. What you should have done was to also provide documents showing that this was indeed your income. If your work was done through your own company you should have provided statements or accounts for that company, showing income from customers and payments to you. If there was no company then receipts and invoices from customers, with amounts that matched the money coming in to your account. Also a tax certificate showing that you declared that amount of income to the government. other documents backing up your statements may work too. In making a second application, the best way to go is to provide all that information to them this time round. This shows that the problem was simply that you omitted to provide the documentation to back up your case. Doing this would give a good chance of success (assuming there are no other problems). The trouble with making a second application based on your parents paying for everything is that they will wonder why you aren't just providing the documents to back up what you said in your first application. If you have the income to pay for the trip yourself, why get your parents to pay? This will lead them to suspect that you were not in fact telling the truth in the first application, and that suspicion will definitely count against you. Being suspected of deception is one of the surest ways of getting a refusal. Not the answer you're looking for? Browse other questions tagged uk visa-refusals tourist-visas standard-visitor-visas or ask your own question.